ScanPapyrus is a software application for scanning paper documents or paper books/copybooks using a flatbed scanner or multifunction device (scanner/printer/copier). ScanPapyrus can save scanned pages as a Adobe PDF, DjVu or Microsoft Word 2007 (.docx) document, or as multiple JPEG, TIFF, BMP, or PNG image files. 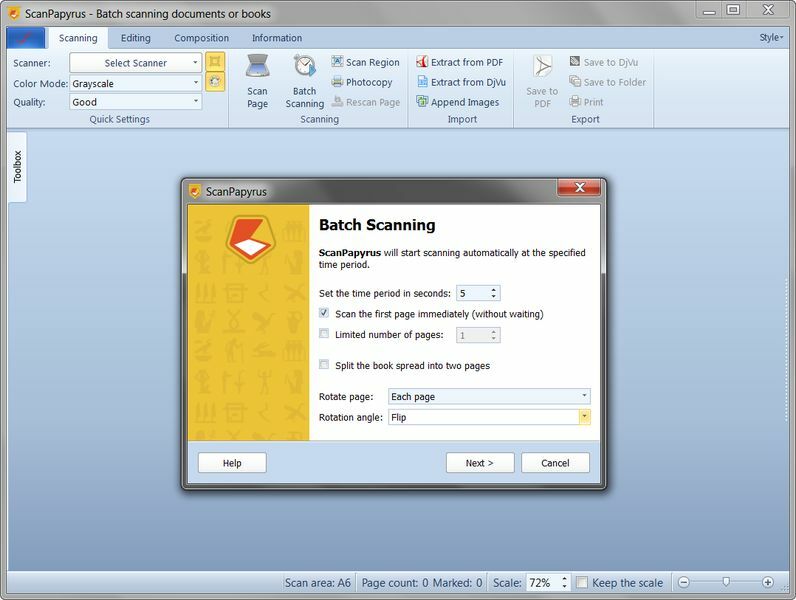 The key feature of this application is the automatic scanning of books or documents: ScanPapyrus can start scanning each page automatically at a specified time interval. During the in-between time, you can turn the page of a book or change the page of a document in the scanner. The application can automatically adjust the resulting image. It can increase the sharpness, remove gray background, crop the image, and remove the black stripes produced by the scanner when its lid is not closed. Now, thanks to the image processing, you can leave the scanner's lid open when scanning a book or a document, and ScanPapyrus will remove the black stripes. Another key feature of this application is the automatic splitting of facing pages into two separate pages. ScanPapyrus detects pages using an intelligent algorithm, so that facing pages can be automatically split into single pages. This way, you can scan a pair of facing pages at once to get two single pages. This approach significantly reduces the time to convert a paper book into the PDF, DjVu or DOCX format. ScanPapyrus can also insert any image from an external image file into your project. The image will be inserted as a PDF page. The following file formats are supported: JPEG, BMP, PNG, and TIFF. ScanPapyrus can process these images, too. It can increase their sharpness, compensate for the background, crop the images to remove unnecessary margins or stripes, and correct any skew. This site does not contain serial number, crack, keygen ScanPapyrus serial number : serial number is the simplest type of crack. A serial number(cdkey,product key,etc) is register the program as you may already know. a crack or keygen may contain harmful software. If you cannot find the exact version you want, just give it a try. for more information read .nfo/.txt/.diz file include in zipped file.